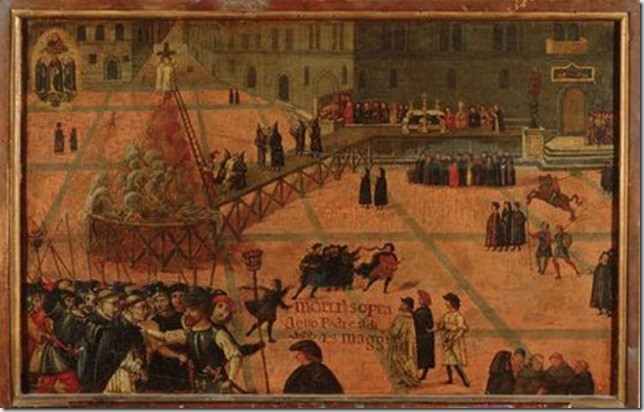 On this date in 1497 supporters of the Dominican friar Girolamo Savonarola conducted a monumental bonfire of the vanities, and, although not the first of its kind, has since been taken as the iconic event of its type (as well as being the last for some time thereafter). 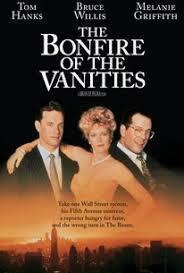 A bonfire of the vanities (falò delle vanità) was the burning of objects such as cosmetics, art, and books condemned by authorities as exemplifications of, or provocations towards, sin. 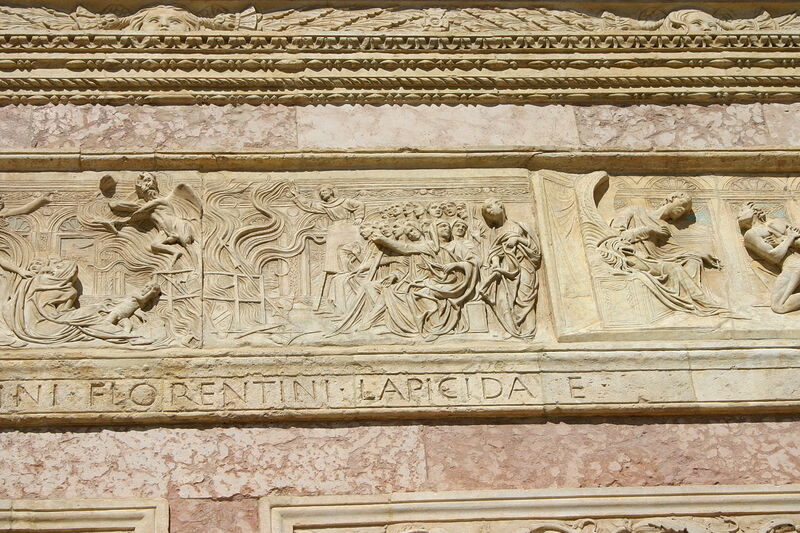 At Carnival in Florence in 1497, Savonarola’s followers collected and publicly burned thousands of such objects. 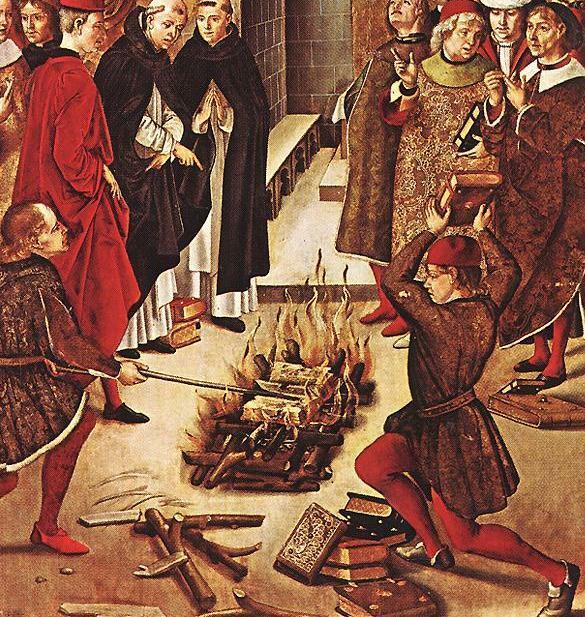 Bonfires of the vanities were not invented by Savonarola, but had been a common accompaniment to the outdoor sermons of San Bernardino di Siena in the first half of the 15th century. The focus of this destruction was nominally on objects that might tempt one to sin, including overt items of vanity such as mirrors, cosmetics, and fine dresses, but also included playing cards, musical instruments, books that were deemed to be immoral, such as works by Boccaccio, and manuscripts of secular songs, as well as artworks, including paintings and sculpture. Fra Girolamo Savonarola was a Dominican friar who was assigned to work in Florence in 1490, largely thanks to the request of Lorenzo de’ Medici – an irony, considering that within a few years Savonarola became one of the foremost enemies of the house of Medici and helped to bring about their downfall in 1494. Savonarola campaigned against what he considered to be the artistic and social excesses of Renaissance Italy, preaching with vigor against any sort of luxury. His power and influence expanded mightily, so that in time he became the effective ruler of Florence, and even had soldiers for his protection following him around everywhere. Beginning in February 1495, during Carnival, Savonarola began to host his regular “bonfire of the vanities.” He collected various objects that he considered to be objectionable: irreplaceable manuscripts, ancient sculptures, antique and contemporary paintings, priceless tapestries, and many other valuable works of art, as well as mirrors, musical instruments, books of divination, astrology, and magic. He destroyed the works of Ovid, Propertius, Dante, and Boccaccio. So great was his influence that he even managed to obtain the cooperation of major contemporary artists such as Sandro Botticelli and Lorenzo di Credi, who reluctantly consigned some of their own works to his bonfires. Anyone who tried to object found their hands being forced by teams of ardent Savonarola supporters. These supporters called themselves Piagnoni (Weepers) after a public nickname that was originally intended as an insult. 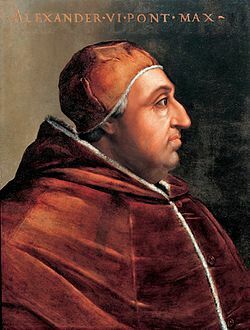 Savonarola’s influence did not go unnoticed by the higher church officials, however, and his excesses earned him the disdain of Pope Alexander VI. He was eventually excommunicated on May 13th, 1497, and executed on May 23, 1498 by being hung on a cross and burned to death. 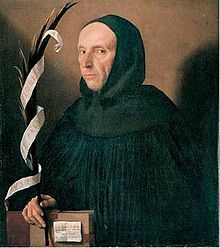 Ironically, the papal authorities would take a leaf out of Savonarola’s book on censorship, because the day after his execution they gave word that anyone in possession of the Friar’s writings had four days to turn them over to a papal agent to be destroyed. Anyone who failed to do so faced excommunication. 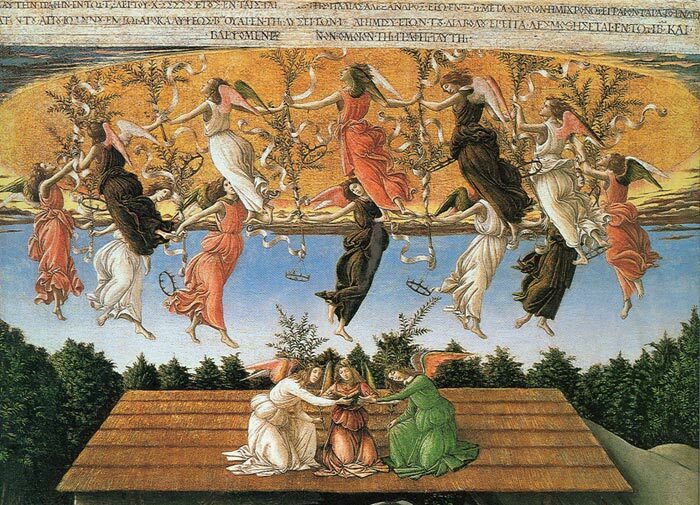 Art historian Rab Hatfield argues that one of Botticelli’s paintings, The Mystical Nativity, is based on the sermon Savonarola delivered on Christmas Eve, 1493. The event has been represented or mentioned in varying degrees of detail in a number of works of historical fiction, including George Eliot’s Romola (1863), E. R. Eddison’s A Fish Dinner in Memison (1941), Irving Stone’s The Agony and the Ecstasy (1961), Chelsea Quinn Yarbro’s The Palace (1978), Michael Ondaatje’s The English Patient – part two 1992, Roger Zelazny and Robert Sheckley’s If at Faust You Don’t Succeed (1993), Timothy Findley’s Pilgrim (1999), Ian Caldwell and Dustin Thomason’s Rule of Four (2004), the novel I, Mona Lisa by Jeanne Kalogridis (2006), the Showtime series The Borgias, The Sky (Italy) and Netflix (North America) series Borgia, and The Botticelli Affair by Traci L. Slatton (2013). 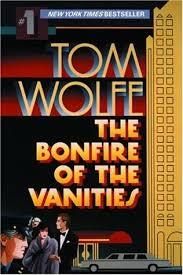 As a metaphor, Tom Wolfe used the event and ritual as the title for his 1987 novel The Bonfire of the Vanities with a film adaptation of the same name. Margaret Atwood’s works allude to the Bonfire, as in her dystopian novels The Handmaid’s Tale (1985), and Oryx and Crake (2003). It is also depicted in the video game Assassin’s Creed II, in which Savonarola is one of the antagonists. Jordan Tannahill’s 2016 play Botticelli in the Fire is a fictional retelling of the events leading up to the Bonfire of the Vanities. I will turn to Maestro Martino author of Libro de Arte Coquinaria (Book on the Art of Cooking) (c. 1465), for today’s recipe. Martino de Rossi was a culinary expert who was considered unequalled at the time and is considered by some (anachronistically) the Western world’s first celebrity chef. He was probably born in northern Italy (in or near Milan) and made his career across Italy. He was the chef at the Roman palazzo of the papal chamberlain (camerlengo), the Patriarch of Aquileia. Martino was applauded by his peers, earning him the epitaph of the prince of cooks. His book is considered a milestone in Italian gastronomic literature, and he a transitional figure from Medieval to Renaissance cuisine. The whole book is available in English translation, of average quality, and you could choose recipes that graced the palates of the vainest of Renaissance Italians. Here is his recipe for an herb frittata, called “frictata” in the 15th century, that I would call modest. The recipe has no measurements, but is fairly straightforward. You can make a plain frittata, one using the poaching water of some herbs, or another using the herbs themselves. My translation is fairly literal. Battirai l’ova molto bene, et inseme un poca de acqua, et un poco di lacte per farla un poco più morbida, item un poco di bon caso grattato, et cocirala in bon botiro perché sia più grassa. Et nota che per farla bona non vole esser voltata né molto cotta. Et volendola fare verde, prendirai slmilmente le cose sopra ditte giognendoli del suco de queste herbe, cioè vieta, petrosillo in bona quantità, borragine, menta, maiorana, salvia in minore quantità, passando il ditto suco; poi cavarai piste le herbe molto bene per la stamegna. Et per fare in un altro modo frittata con herbe, prendirai le sopra ditte herbe et tagliate menute le frigerai un poco in un bon botiro o oglio, mescolandole con l’ova et l’altre cose sopra ditte farai la frittata et cocirala diligentemente che sia bene staionata et non troppo cotta. Beat eggs very well with a little water and a little milk to make it [the frittata] softer; also a little good cheese, grated, and cook it in good butter because it will be fattier. Note that, for it to be good, it should not be stirred nor cooked too much. If you wish to make it green, do the same as above and add the cooking water from the following herbs: chard, a generous amount of parsley, borage, mint, marjoram, and a lesser amount of sage, passing them through a sieve to obtain their water; then remove the herbs that will have been crushed in the sieve. 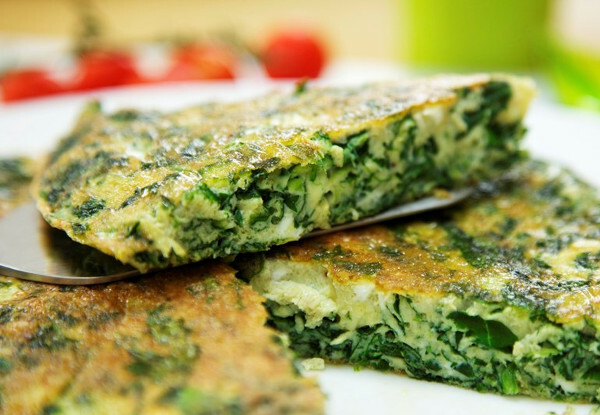 And to make a frittata another way with herbs is to take the above herbs, finely chop them and fry them in a little good butter or oil, mixing with eggs and the other ingredients mentioned above you make the frittata and cook it carefully, well seasoned, and not cooked too much.